Sponsor one of our delicious little cuties at our Ikhaya Labantwana “House of the Children” Montessori Early Learning Centre, giving them the best possible start in life. We have 12 children ranging from three to five years old who are still looking for sponsors. Or get involved with our surprisingly motivated teenagers and support them to complete the final three years of their senior school education. Often they are the first in their families to finish school and matriculate! 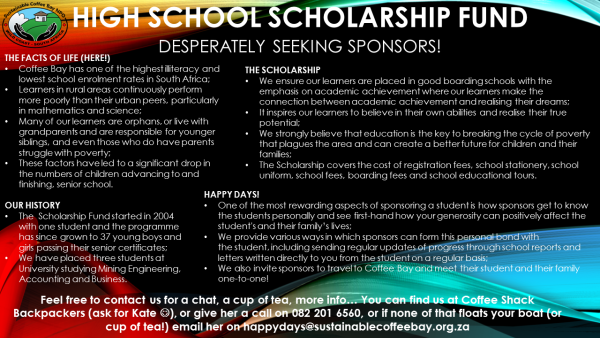 We currently have 5 students on the Scholarship Fund and are seeking sponsors for three exceptional students to start in 2017. Either way, the options are many, the benefits are huge and the life-long love of learning is passed along to the next generation.